We spent the whole month of August traveling in Colombia. It was simple as that. But how it happened, that in a country, where we originally planned to spend one month, here we are, sitting in a comfortable lounge of our hotel in San Agustin and working on our blog posts instead of quickly moving around? First of all, we really planned to be in Colombia for 4 or 5 weeks maximum, but it was eight weeks already, and we haven't left yet. The number one reason why we are still here is not hard to guess. We didn't expect to enjoy traveling in Colombia that much, especially when there other dark horses on our itinerary. But maybe this was the best way how to enjoy the country. Not to have high expectations and later be amazed by natural wonders, enjoy the rich diversity of the landscape, relax on the shore of the ocean, leisurely stroll colonial streets of colorful towns and drink Colombian coffee. The reason also can be, that our traveling style changed a little over the years. We don't rush as we used to as moving every day from one place to another, taking every day another bone breaking bus or sleeping every day in a different hotel can be tiring after some time, and now we prefer to travel in a more comfortable way (although many still wouldn't consider it comfortable at all), we care more about our safety and even though a few years back we would be able to walk 2 km from bus station with 20 kg backpack just to save a few bucks, today, we rather take a taxi (still not every time though), not only to save some time, energy, but also to increase our safety. But back to Colombia. After we returned from Tayrona NP, we spent a few days in beautiful Cartagena, and from there, we took an overnight bus to Medellin (it took 15 hours instead of advertised 13, but we were already experienced and knew that we must add at least two hours to get our arrival time. In Medellin, we took a great walking tour around the city, took a cable car to Arvi Park and also visited Guatape as a one day-trip from Medellin. Medellin, is a city transforming and healing from the bloody past and anyway cool now it can be, didn't amazed us. Despite the fact that many travelers don't make it to Jardin, for us, it was a place, where we had great coffee, did some bird watching, easy hiking and most importantly, it was the place where we finally got back our appetite. Until this moment, we found Colombian food dull, greasy and we lost our appetite for week or so, but in Jardin, finally we found some good restaurants and discovered what food we have to order to enjoy life again. Highlights of our travels in August came when we arrived to Salento. Here, we visited a coffee farm, did the famous hike Valle de Cocora and most importantly, we hiked for four days through Los Nevados National Park, where we trekked through Paramo ecosystem and climbed the glacier Nevado Santa Isabel, both for the first time. This hike was for us important for a different reason as well. We got a proof that having travel blog has sense, that someone likes our work and is willing to invest in us with confidence, that the cooperation will pay off in the future. 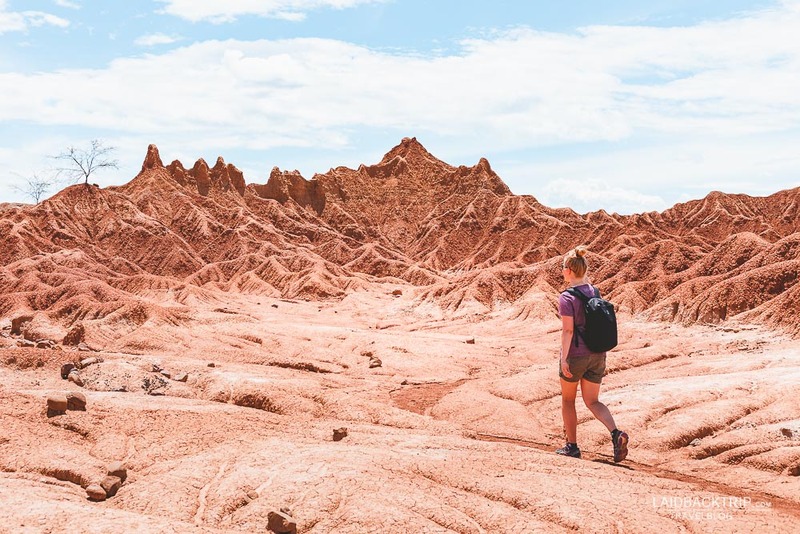 After this lifetime experience, and only two days after we climbed to 5 000 meters, we emerged in Tatacoa desert where temperature was hitting 40°C. We hiked in Red Desert and Gray Desert, got lost twice, and right after, we moved to San Agustin, an important Colombian archeological site. Here, we rode a horse, took a full day tour in a bumpy jeep and the result came quickly. As many times before, Martin's back got strained and we had to take break for a while. By this time, we were hoping to cross borders to Ecuador, but it seems that it will be story for September.